Director: Imunga Ivanga. Cast: David Nguema Nkoghe, Emile Mepango Matala, Evrard Ella Okoue, Roland Nkeyi, Anouchka Mabamba Mboumba, Henriette Fenda, Marie Françoise Mimbie, Fidèle Edembe Gomes, Dominique Douma, Romfo Ndimbina Moussambi, Jean-Dominique Bickai, Frank Pango. Screenplay: Imunga Ivanga. A Slumdog Millionaire nearly ten years avant la Boyle, this shortish Gabonese feature has the good sense to avoid either the chirpy fructification of poverty as entertainment or the sensationalizing of grisly violence as an entrée into the life of some dream-deferred youths. School kid Mougler (David Nguema Nkoghe) wants to get in on the hip-hop game with his pals, especially lead emcee Baby Lee (Emile Mepango Matala), who sports a Fugees T-shirt while he rehearses the French-language lyrics of his favorite artists and chastises his buddies for mucking up their parts. It would be easier to hold the rhythm and master the words if these kids had a radio, which they still refer to as a "ghetto blaster," a few years after you stopped hearing that term quite so much in the American streets. Despite the likelihood that huge swaths of Dôlè's audience won't ever have seen a Gabonese film, or perhaps any West African film or any images of Gabon or Libreville at all, writer-director Imunga Ivanga isn't interested in the kind of social cross-section that would contextualize where and how and in relation to whom these kids live, to include whether they have their own "ghetto" to blast. It doesn't quite look it, but unlike Boyle, Ivanga associates the frustration of have-nots with a series of sharply coded rules, fantasies, and assumptions, not with grabby emblems of abjection or televised deliverance. In one key scene where the kids find what they've been looking for and devise a way to swipe it, we do sense a lingering, possibly indexical mistrust between the dark-skinned Gabonese, including some older customers, and the Lebanese immigrants who run the local shop. Still, Dôlè isn't a demographic allegory. Like any number of his compeers on the continent, Ivanga is more interested in telling a bittersweet story tightly knit around his characters, where the accents on lachrymose drama (an ailing mother, a stolen girlfriend) alternate with those of charming comedy (classroom embarrassments, fumbling flirtations), leaving some question as to what kind of conclusion the film will finally seek. That I had heard Dôlè pitched as a West African Boyz N the Hood was something of a tip-off, but it's not an analogy that finally makes sense. 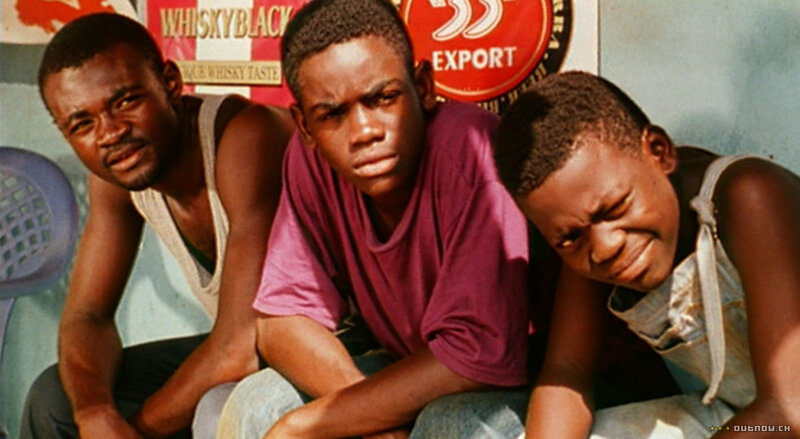 Where Singleton tragically halts his characters in their pursuit of lofty and honorable goals, or in Doughboy's case a deeply invested code of personal honor, the Dôlè kids cook up a pretty petty agenda to take what they need in the moment. The stakes aren't nearly as high, in the story or in the filmmaking, and the script's accretion of motivations as well as the remarkable leniency of the victims in this slapdash crime suggest that Ivanga can't quite help himself from softening his critique of both his characters and their society. Despite a strong start, he really muddies his storytelling, nowhere more so than in the truncated climax. Judged strictly as narrative, Dôlèwhich takes its title from a scratch-lottery contest that becomes all the rage in this Libreville neighborhood when one of its citizens actually winsemerges as a minor work that hasn't fully thought through its dramatic arcs or its intended messages.